Edited by Game, October 28, 2016 - 02:33 PM. It's been a great ride, but all good things must come to an end. One of my favorite kobe moments has to be that raptor game in 2013 where kobe went off making 3 impossible 3's in a row. Then at the end my cousin runs up to double team him but pretty much just set a screen for kobe to take it to the hole for a game winning dunk. I remember being this little 5 year old when I first heard about Kobe & the Lakers. Shaq always made me laugh, but Kobe always grabbed my attention during gametime. I was enthralled by Kobe's tenacity and will to win. I kept hearing how he was only 18 years old back then from my older brothers, but as a kid, I didn't know how crazy that was. But I will always remember both my older brothers saying, "You know, they say he might be the next MJ." At the time, Michael Jordan was the only basketball player I knew about, so to hear that about a young kid who entered the draft right after high school... it intrigued me to say the least. Kobe wouldn't back down from anyone - took on any challenge. They said he couldn't win without Shaq, but he earned two more rings after Shaq left. The thing with Kobe is that he learned as much as he could from all the great players that came before him. His knowledge of the game encouraged me to learn more and more about the game, and his appreciation/admiration of the Laker history molded my love for the Lakers. To go from shooting airballs in the playoffs to hitting gamewinners/clutch shot after clutch shot. What a crazy ride. 20 years. Time sure does fly by. I always appreciated his work ethic, always pushing himself and those around him to get better each day. There are numerous memories that Kobe has left us with, & not just for us Laker fans, but for basketball fans in general. The 5 Championships. The stretch of 9 games in a row w/ at least 40pts. The stretch of 4 games w/ at least 50pts. Outscoring the entire Mavs team after 3 quarters (Kobe: 62 Mavs: 61). The 81 point game against the Raptors. 12 3pt shots in a game. All those gamewinners/clutch shots. The times where we all thought the game was lost, but Kobe comes in to save the day. I remember a time when no matter how many points we were down, if Kobe was playing, we all thought we still had a chance. There will never be another Michael Jordan, and in the same vein, there will never be another Kobe Bryant. There's plenty more I could go on talking about... but all I really want to say is... Thank you, Kobe. this is it eh...man where do i start? lakers will add 8 and 24 on the home court. The game hasn't even started, and you guys are getting me all emotional lol. Thank you for everything, Kobe! Now let's get a W tonight! This is it. What a ride it has been... 20 years went by so fast... Too emotionally drained to make a long post. Hope we win tonight. Getting the W tonight should be all that matters. 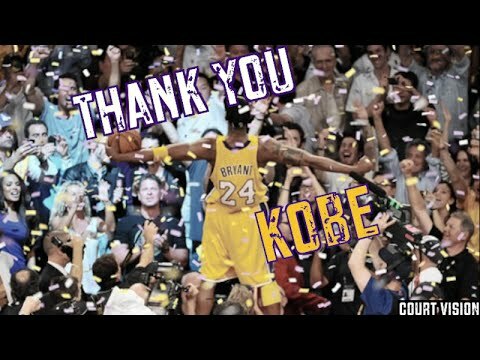 Kobe is the last legend. Edited by erfolk, April 13, 2016 - 02:52 PM. I think everyone will, even Kobe. He will address the fans after the game, and I doubt he will be able to keep it in. The Jazz are fighting for a playoff spot. Let's see if Kobe's last game throws them off, because I know for sure every Laker that plays tonight is going to bring incredible energy to the floor.